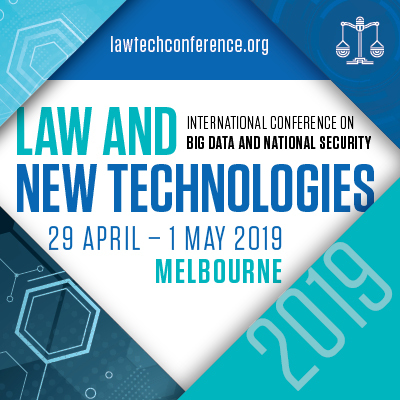 The inaugural Law and New Technologies International Conference on Big Data and National Security will be held from 29 April to 1 May 2019 at the Melbourne Convention and Exhibition Centre. The Conference is organised by the Law and Policy Programme of the Data to Decisions Cooperative Research Centre (D2D CRC), a program involving Deakin Law School, Deakin University; La Trobe Law School, La Trobe University; and UNSW Law, University of New South Wales. The Conference will be a forum for analysing current opportunities and challenges relating to the use of data technologies to address Australian national security and law enforcement objectives. It will also focus on regulation of these technologies. The conference will bring together jurists, legal practitioners, data science and IT specialists, software engineers, policy-makers, national security and law enforcement experts. It is structured to enable invited experts from various disciplines to present current research and to facilitate multi-disciplinary discussion between researchers, practitioners, and lawyers. Participation will provide you with the unique opportunity to deepen your insights about the implications of new data technologies for national security and law enforcement use globally and to discuss appropriate policy and legal responses to the benefits and risks their application holds in this context.